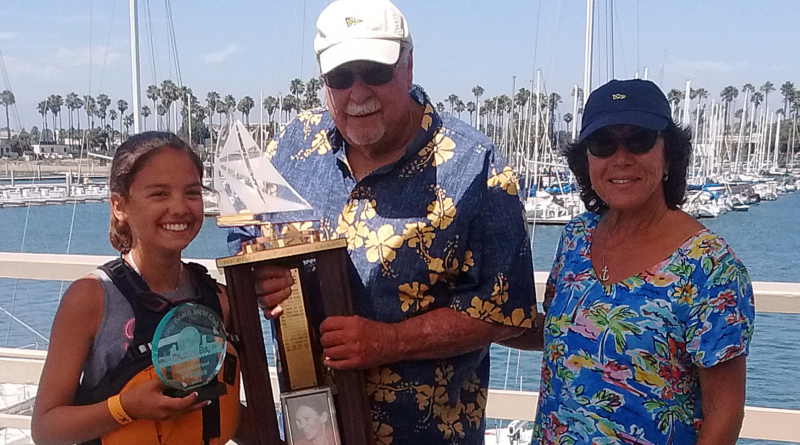 LONG BEACH — Victoria Messano of Alamitos Bay Yacht Club won the 2017 Jessica Uniack Memorial Beach to Bay perpetual trophy in her Naples Sabot (C3 class); she was awarded the trophy for finishing in first place in the largest class. This is the 30th year for this traditional junior sailing race hosted by Long Beach Yacht Club and sponsored by Bellingham Marine. Race Director and LBYC Sailing Director, Jess Gerry, postponed the start of the race for about an hour while they waited for the morning breeze to fill in. Once all of the 157 young sailors in 14 classes – ranging in age from 7 to 17 – were underway, it only took them a little more 2.5 hours for all of the boats to sail the 5-mile course inside Long Beach Harbor and finish in front of Long Beach YC’s Bridge Deck. Escorted by a flotilla of skilled coaches, volunteers from local area yacht clubs and the City of Long Beach Lifeguard boats, the sailors enjoyed moderate breezes of 5-7 knots under sunny summer skies with relatively calm seas. Coaches were on hand when one or two boats failed to sail through the finish line. With a little encouragement, they found their way back and finished the race. First place finishers in the other classes were; Ryan Misterly of Huntington Harbour Yacht Club in the Bic Fleet; Sean Colley of ABYC in the CFJ Fleet; Peter Sangmeister of LBYC in the Laser Fleet; William Mueller of ABYC in the Laser Radial Fleet; Sam Shuart-Janes of ABYC in the Laser 4.7 Fleet; Cameron Farmer of ABYC in the Optimist Fleet; Preston Woodworth of LBYC in the Sabot A Fleet; Jack Halliday of HHYC in the Sabot B Fleet; Alex Lech of LBYC in the Sabot C1 Fleet; Madison Mansour of LBYC in the Sabot C2 Fleet and Rowan Spates of Dana Point Yacht Club in the RS Tera Fleet. Many of these classes sail in bays and occasionally on the ocean, but this is the only junior sailing event of the year where the 8-foot-long Sabots ever venture out on the ocean. The event is named for Jessica Uniack, a tireless volunteer and supporter of junior sailing who died tragically in 1994. Her husband Bill and sons Billy and Alex carry on her work with this event that began in 1988 and was renamed in her honor in 1995.